Traveling over 2100 miles from the West Coast to the Midwest can be a long haul. Now add barrels of beer to the mix. For years a California based brewery, recognized as one of the largest craft breweries in the nation, has been delivering its beer to the Midwest. When the company decided to expand, due to growth in popularity, there was no question where the new facility would be located. 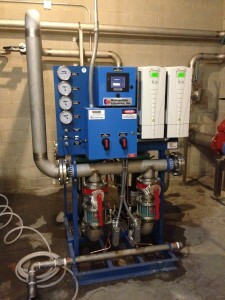 The pump package includes three variable speed duplex booster pumps. Once a former steel plant and recent TV set for productions like Chicago Fire, the 300,000 square foot facility on Chicago’s South Side, has been transformed into the largest craft brewery in Illinois after opening for operation in April. A facility so large, it has the ability to produce 500,000 barrels of beer per year. That’s 450 bottles of beer per minute! As a major ingredient in beer, water plays a big role in a brewing facility. So how exactly do water and beer meet? 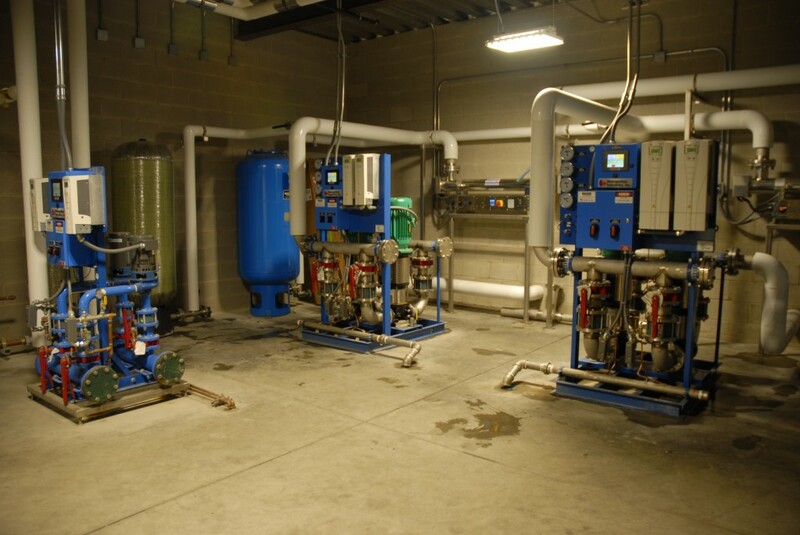 The answer is in the basement of the brewery where pump systems use the technology and equipment needed to send pure water from the outside water supply to where it needs to go within the facility. With the warm up throughout the country and the large beer demands the company expected in the summer months, accommodations were made to accelerate the design, production and installation process of the booster systems installed at the facility. In collaboration with Building Engineering Systems of Chicago, Ill., Metropolitan Industries met the challenge and within a three-week period the two most critical systems that service the bottling plant were installed on time with a seamless startup. The pump package, manufactured by Metropolitan, includes three variable speed duplex water pressure booster systems with the capability for the pumps to run off of one another if needed. Two of the three booster systems service the facility’s bottling plant. The two duplex booster pump systems are designed to provide 250 gallons per minute (gpm) with one at a discharge pressure of 110 pounds per square inch (psi) and the other at a discharge pressure of 80 psi when supplied with a minimum net suction pressure of 30 psi. The third duplex booster pump system is for domestic use and will service the taproom in the facility. It is an energy efficient variable speed prefabricated duplex pumping system designed to provide 90 gpm at a discharge pressure of 60 psi when supplied with a minimum net suction pressure of 30 psi. Each pump is cast iron stainless-fitted with cast iron casings. In addition, each panel is equipped with a color touch screen operator interface, programmable controller with audible and visual alarms, and remote alarm contact. The controls in each system are designed to raise the set-point pressure at low flow periods, charge the tank and shut down the pumps until flow resumes. The duplex booster pump pictured will service the taproom looking over the bottling plant. 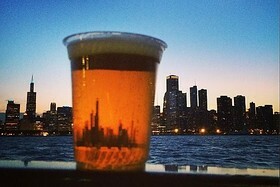 Today, the Chicago location can bottle beer to the capacity of the California facility (15.5 million gallons a year), but plans for expansion of the Chicago facility are expected to triple the capacity by the end of the year when the brewery will be producing beer for various cities east of Denver. If water is one of the main ingredients in beer, the pump system helping push the water through the brewery is just as important. Thanks to new technology, manufacturers and engineers now have solutions to help provide cool, clean water at the rate needed by the beer process.